This is an add-on to a series of modular sets of typical US residential and suburban streets and sidewalks. This add-on set features four road segments with driveway entrances/exits. A road segment is provided for all four directions. 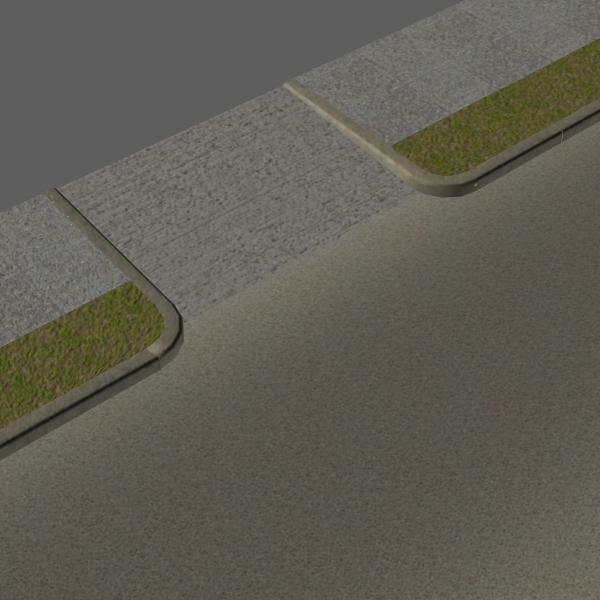 Each segment can be duplicated and added into your scene to create any combination of street system you like. Files are provided in OBJ and PP2 format. These have been tested (and created) in Hexagon 2.5 and Daz Studio 4.5 on a Mac platform. Hopefully, PC and Poser 6 and above users should have no problems. Texture and Bump files are in high-resolution JPEG format. mbhdesign (6 years ago) Inappropriate? @launok: I'll send you an email with download links for you. Thanks! @graykeeper: You are very welcome! Glad I could help! Thank you so much! I now have no excuse not to model that neighborhood I've always wanted to do.